Let the big room shake. If you ever saw Yoji Biomehanika ever step up to a set of DJ decks, you'd probably be unable to look away. As soon as he walks on stage, his visual appearance can be a bit startling for the unexpecting. In the early 2000s, he sported impressively lengthy dredlocks dyed safety orange and fake eyelashes that could lure even the most savage of beasts. Nowadays, the eyelashes remain, but he has transformed his image into that of a more androgynous being with swooping black-and-white gradient hair. He also got rid of his tangly chin tuft. Yoji may be known for his image alone, but it's a shame because when he puts his mind to it, he can crank out some hard tunes. That's just what he did back in 2004 with his sophomore album, "Tales From The Big Room". 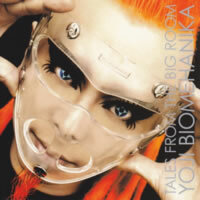 Yoji Biomehanika (or simply "Yoji", as he is now called) is basically Japan's posterboy for hard trance music. He doesn't mess around; his work will kick you in the eardrums. But he can have a softer side as well, as evidenced at certain points in the album. But he starts us off with A Theme From Banginglobe (Exclusive Album Edit Mix). I don't exactly know what Banginglobe is; perhaps it's an actual live event, perhaps not. But after a spacey introduction, Yoji leads us right into some bangin' beats and a hardstyle bass to get the party going, alongside some alarmish synth stabs. So the break hits and we get a haunting theme that will eventually make its way back into the song later as the main melody. This is the embodiment of hard trance, though for how long a person can throw their hands in the air is anybody's guess. B-Raver takes the album in a completely different direction, focusing more on breakbeats. I love the sample he uses, a heavily vocoded phrase saying, "If Arnold Schwarzenegger was a tune..." If he WAS a tune, I think this would be it. Unfortunately, its focus is more on wild beats and scratchy sounds than any distinct melody. It's not for relaxing listening, I'll say that. Perhaps the most well-known track off the album is Hardstyle Disco (Exclusive Hard Bass Edit Mix), perhaps the most straightforward hard trance song on the album. Just about the first half of it is an average buildup, not showing any signs of things to come. But when the alarm-style synth hits again, you know that some hardstyle disco is going to strike! This one can get feet moving in a club, though it can get a bit monotonous after a while. That's why Yoji decided to switch up the rhythm a bit so that it sounds like a new song. Crafty, my friend. Hardhouse Raver initially suffers from the same relative inaccessibility as B-Raver, with the same squelchy synth formula that are more suitable for hard DJ sets than home listening. In an unexpected move, however, Yoji throws in a random trance melody right in the middle, freed from its hardstyle surroundings. I wish he had used the melody as a greater factor in the actual song, rather than as something wedged in the middle, but I should take what I can get and be satisfied. And then you have Samurai (The Keyboard Cowboys) and The Rain (Jumpin' Techno Mix), two songs that may irritate those unfamiliar or uncomfortable with the hardstyle vibe. Samurai uses a potentially annoying chiptune synth to show off its melody amongst gritty thumps and beats; I'm not a particular fan of this track, but for enthusiasts of the genre, it could very well be ambrosia. The Rain reminds me more of Mauro Picotto's older work: a heavy focus on rolling beats while distorting small samples to form danceable hits. While The Rain is amazingly repetitive and rather dry (lacking significant variety throughout), it does have its notable points, particularly the absolutely sweet perversion of the vocals right in the middle. Yoji then goes for his final lap with some very impressive trance tracks. Never End (Exclusive Groove Edit Mix) is an eight-point-five-minute mix that leads us on a little journey from standard beats all the way to a full-fledged dance melody that, while simple, could blow minds and speakers on the dancefloor. And this time, he knew well enough to add variety throughout the seemingly endless buildup (the melody doesn't officially kick in until after the five-minute mark). For any electronic music fan, this is a gem. Monochroma, for whose vinyl I reviewed an extremely long time ago, continues Yoji's ascent back into melodic bliss, pulling him away from frantic drumlines in the process. Monochroma is melancholy in trance form, to put it bluntly. Stringed pads feel very odd in a Yoji Biomehanika track, and yet they are perfectly placed. Of course, this could have been a very classy track, but the analog synth that chimes in during the second half isn't as fitting, though I wouldn't remove it, either. A very intriguing offering from Japan's king of hard house. The Dignity (Progressive Mix) brings in some breakbeats for the first segment, which leads us into another saddening and very space-oriented melody. I never found this song to be anything particularly notable, but at the same time, I can't pull myself away from listening to it in its entirety. How odd... To close out this list of tales from that supposed big room, there is Tales Continue... (Exclusive Album Mix). This is a purely synth-based affair with no kicks, snares, or hi-hats in sight. Tales Continue... makes the listener feel like they are slowly drifting off into unknown lands, or perhaps even into far-off galaxies in space with its twinkly arpeggiations and distinct sensations of emptiness. It's an unexpected end to an album that tried to kill me with squeaks and audio punches. I believe this album has its definitely highs and lows, at least for me. I don't recommend this album to just anybody; you really have to be a fan of electronic music -- and I mean more than just David Guetta on the radio. Yoji Biomehanika is accessible and radio-friendly at times, but some of his work simply would be out of place across the general airwaves. So the bottom line is this: if you love trance music or hardstyle music, check out this album. If you're really gun-shy about new and quirky electronic tunes, perhaps you should only select the tracks I specifically recommended as actually HAVING melodies. The only questions remaining is... where IS this "big room"?